CANUDOS, Brazil, Nov 2 2017 (IPS) - Irrigated green fields of vineyards and monoculture crops coexist in Brazil’s semiarid Northeast with dry plains dotted with flowering cacti and native crops traditionally planted by the locals. Two models of development in struggle, with very different fruits. On his 17-hectare farm in Canudos, in the state of Bahia, João Afonso Almeida grows vegetables, sorghum, passion fruit (Passiflora edulis), palm trees, citrus and forage plants. 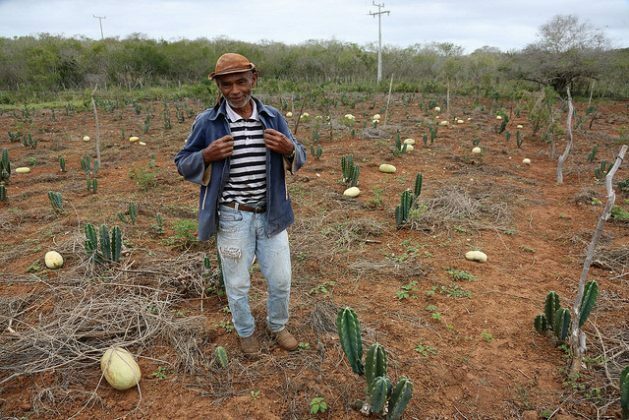 Between the rows, cactus plants grow to feed his goats and sheep, such as guandú (Cajanus cajan), wild watermelon, leucaena and mandacurú (Cereus jamacaru). The earth is dry and dusty in the Caatinga, an ecosystem exclusive to Brazil’s semiarid region, where droughts can last for years, alternating with periods of annual rainfall of 200 to 800 mm, along with high evaporation rates. But thanks to simple rainwater harvesting techniques, Almeida has managed to live harmoniously with the local ecosystem. 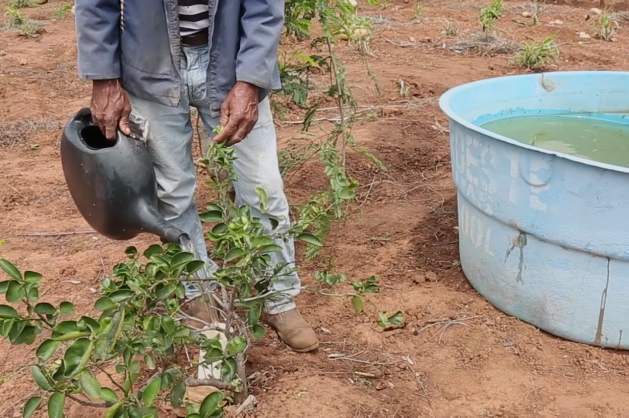 “This is a water harvesting ‘calçadão’ (embankment),” he told IPS, showing a tank installed with the help of the Regional Institute for Appropriate Small Farming (IRPAA), which is part of the Networking in Brazil’s Semiarid Region (ASA) movement, along with another 3,000 social organisations. “The water goes to the tank-calçadão that has a capacity to store 52,000 litres. We use it to water the garden. It provides an income for the families,” he added. For domestic consumption, he has a 16,000-litre tank that collects rainwater from the roof of his house through gutters and pipes. ASA has installed one million tanks for family consumption and 250,000 for small agricultural facilities in the semiarid Northeast. 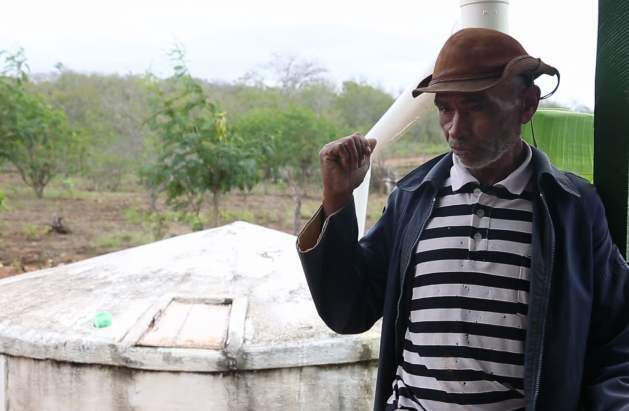 Almeida uses an “enxurrada” (flow) tank, and an irrigation system for his citrus trees, which through a narrow pipe irrigates the roots without wasting water. He also opted for plants native to the Caatinga that adapt naturally to the local climate and soil conditions. “Production has improved a great deal, we work less and have better results. And we also conserve the Caatinga ecosystem. I believed in this, while many people did not, and thank God because we sleep well even though we’ve already had three years of drought,” he said. In the past, droughts used to kill in this region. Between 1979 and 1983, drought caused up to one million deaths, and drove a mass exodus to large cities due to thirst and hunger. “The farm used to be far from any source of water. We had to walk two to three kilometers, setting out early with buckets,” he recalled. The droughts did not end but they no longer produce deaths among the peasants of Brazil’s semiarid Northeast, a region that is home to some 23 million of Brazil’s 208 million people. This was thanks to the strategy of “coexistence with the semiarid”, promoted by ASA, in contrast with the historical policies of the “drought industry”, which exploited the tragedy, charging high prices for water or exchanging it for votes, distributing water in tanker trucks. “Coexistence with the semiarid ecosystem is something completely natural that actually people around the world have done in relation to their climates. The Eskimos coexist with the icy Arctic climate, the Tuareg (nomads of the Sahara desert) coexist with the desert climate,” the president of the IRPAA, Harold Schistek, told IPS in his office in the city of Juazeiro, in the Northeast state of Bahía. “What we have done is simply to read nature. Observing how plants can survive for eight months without rain, and how animals adapt to drought, and drawing conclusions for how people should do things. It is not about technology or books. It is simply observation of nature applied to human action,” he explained. The “coexistence” is based on respecting the ecosystem and reviving traditional agricultural practices. The basic principle is to store up in preparation for drought – everything from water to native seeds, and fodder for goats and sheep, the most resistant species. 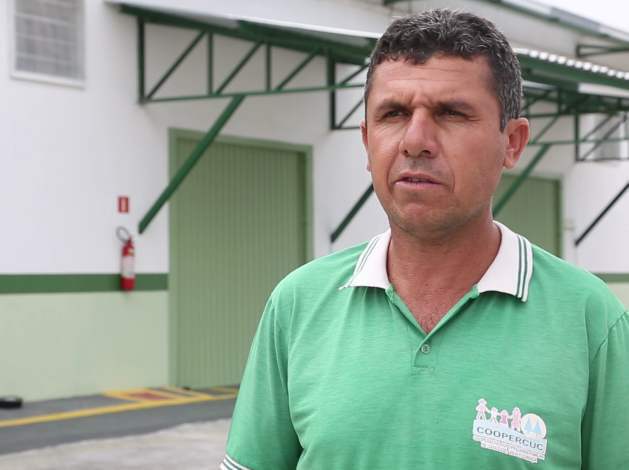 The fruits are seen in the Cooperative of Farming Families from Canudos and Curaçá (Coopercuc), made up of about 250 families from those municipalities in the state of Bahía. Coopercuc, which Almeida is a member of, has an industrial plant in Uauá, where they make jellies and jams with fruits of the Caaatinga, such as umbú (Spondias tuberosa) and passion fruit, with pulps processed in mini-factories run by the cooperative members. “We’re not only concerned with making a profit but also with the sustainable use of the raw materials of the Caatinga. For example, the harvest of the ombú (Phytolacca dioica) used to be done in a very harmful way, swinging the tree to make the fruit fall,” Coopercuc vice-president José Edimilson Alves told IPS. The cooperative sells its products, free of agrochemicals, to large Brazilian cities and has exported to France and Austria. “This proposal shows that it is possible to live, and with a good quality of life, in the semiarid region,” said Alves. This reality exists in the 200,000-hectare fruit-growing area of the São Francisco River valley, located between the municipalities of Petrolina (state of Pernambuco) and Juazeiro. Government incentives and irrigation techniques favoured the installation of agribusiness in the area. 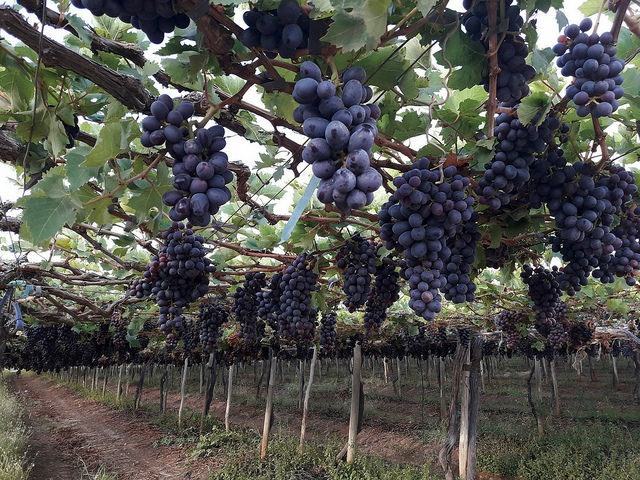 According to the State Development Company of the Valleys of São Francisco and Parnaíba, fruit growers in the area generate over 800 million dollars a year, and provide about 100,000 jobs. “It is estimated that this use of irrigation represents 80 percent of all uses of the basin. But we have to consider that the collection of water for these projects promotes the economic and social development of our region by generating employment and revenues, through the export of fresh and canned fruit to Europe and the United States,” explained the company’s manager, Joselito Menezes. The company Especial Fruit, which has about 3,000 hectares in the valley and 2,200 workers, produces thousands of tons of grapes and mangos every year, which are exported mostly to the United States, Argentina and Chile, along with a smaller volume of melons, for the local market. “All the irrigation is done with the drip system, since good management of water is very important due to the limitations of water resources,” the company’s president Suemi Koshiyama told IPS. “The region that has the least water is the one that uses the most. Thousands of litres are used to produce crops, so when the region exports it is also exporting water and minerals from the soil, especially with sugarcane,” said Moacir dos Santos, an expert at the IRPAA. “In a region with very little water and fertile soil, we have to question the validity of this. The scarce water should be used to produce food, in a sustainable manner,” he told IPS. According to ASA, one and a half million farm families have only 4.2 percent of the arable land in the semiarid region, while 1.3 percent of the agro-industrial farms of over 1,000 hectares occupy 38 percent of the lands. “Family farmers produce the food. Agribusiness produces commodities. And although it has a strong impact on the trade balance, at a local level, family farming actually supplies the economy,” dos Santos said.